Kiteboarding lessons 7 days a week at the best location on the coastline. Call to book your lessons at (361) 332-9031. We utilize shallow, flat water locations that make it easy to learn. 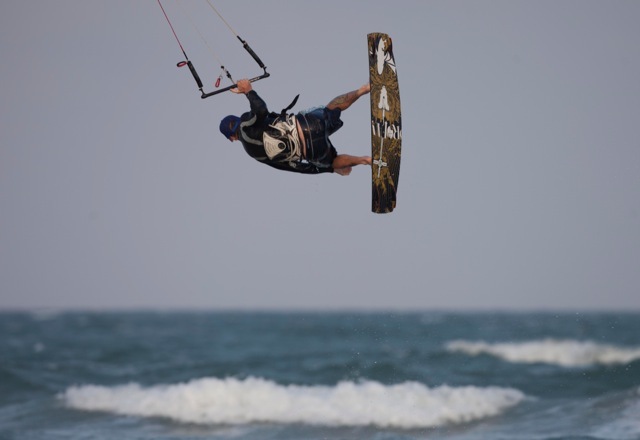 On windy days our kiteboarding lesson is a great way to take advantage of the coastline and try something new. When you are ready to purchase gear we have a full line of new and used equipment available and offer support in choosing whats right for you. Lowest priced lessons on the coastline! Add a second person for $100. Flying the kite is the most fundamental part of becoming a kiteboarder. Ground control covers kite set up, wind window theory (where the kite will fly and why), generating power with the kite, how to safely put the kite down. Time to hit the water! After completing ground control you are ready to learn some basic steps that get you ready to progress toward getting a board on and riding. We cover the set up of a large inflatable kite we will use on the water and how the bar, kite, and safety systems work. You will learn launching and landing, features of kite and how they work with the bar and lines, relaunching the kite off the water, body dragging (important for getting back to your board or the beach),generating power with the kite, flying the kite one handed to get a board on, and sending the kite through the window to generate power and ride. Sunglasses are most important for looking up into the sun at the kite, polarized work best if you have them. Rash guards and plenty of sunscreen. Also a hat works great for keeping more sun out of your eyes.